Save 1% on the Tide Clock, Thermometer and Hygrometer by Bey-Berk at Aulainter Americana. MPN: WS420. Hurry! Limited time offer. Offer valid only while supplies last. WS420 Features: -German precision weather instrument.-Ash wood frame.-Brass.-Instruments rotate so item may be hung horizontally or vertically. WS420 Features: -German precision weather instrument.-Ash wood frame.-Brass.-Instruments rotate so item may be hung horizontally or vertically. Warranty: -1 month manufacturer warranty. 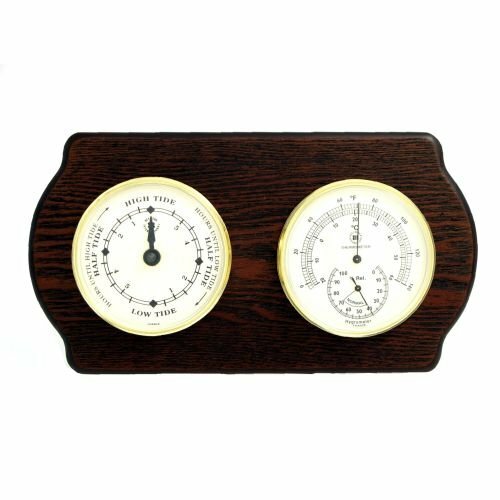 The tide clock & thermometer/hygrometer on ash weather station measures 11"H x 6"W x 2"D.
This item features a tide clock & thermometer/hygrometer in solid brass tarnish proof cases with a ash wood base. The instruments on this item will turn giving you the option of hanging the weather station vertically or horizontally.